Here is a collection of frequently asked questions that I have put together to help you in selling a home. If you have any other questions, not listed here, feel free to call or send an e-mail. How do I cancel my MLS listing? 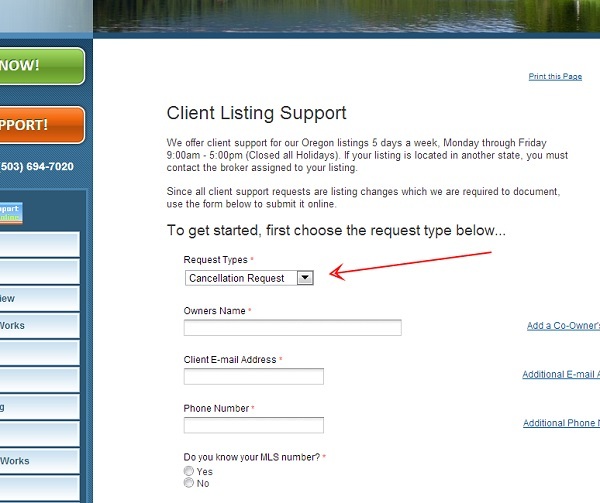 You can cancel your MLS listing two ways: The first way is to log into your ByOwnerOregon.com account then under the "MLS Listing Management" you will see a drop down menu. Click on the drop down and select "Cancellation Request". The second way is to click on the "Contact Us" link on the left hand menu bar. The click on "Support". Then select the "Cancellation Request" from the drop down. Once you submit the cancellation request form we will cancel the MLS listing typically within 24 hours and e-mail confirmation to you. Cancellation requests submitted outside of business hours will be processed the next business day. How do I change the status of my MLS listing after I accept an offer? 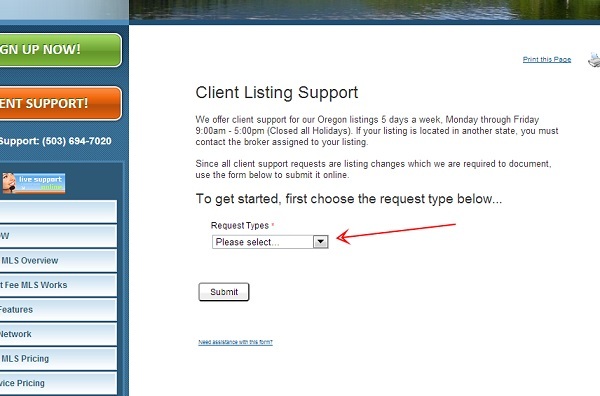 You can change the status of your MLS listing by clicking on the Orange Client Support button. Then select the "Status Update Request" from the drop down menu. Once you submit the Status Update Request Form we will update the status of the MLS listing typically within 24 hours and e-mail confirmation to you. How do I load photos to my By Owner Oregon webpage? To load photos to your By Owner Oregon webpage you need to log into your account. This will take you to the Listing Control Panel. 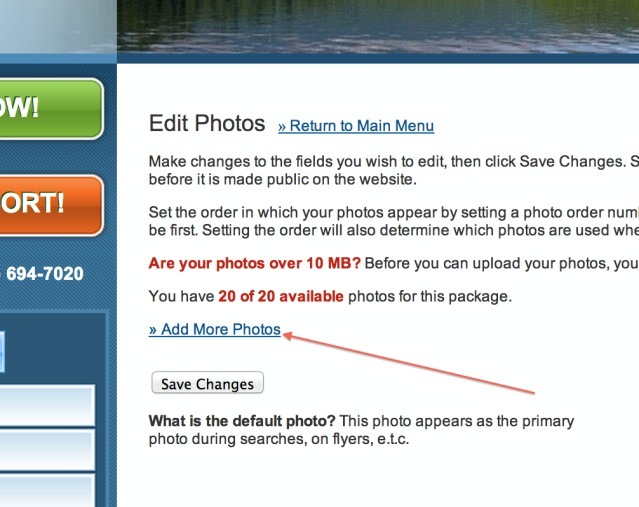 Then scroll down to the link that says Add/Edit Photos. How do I make a change to my MLS listing? 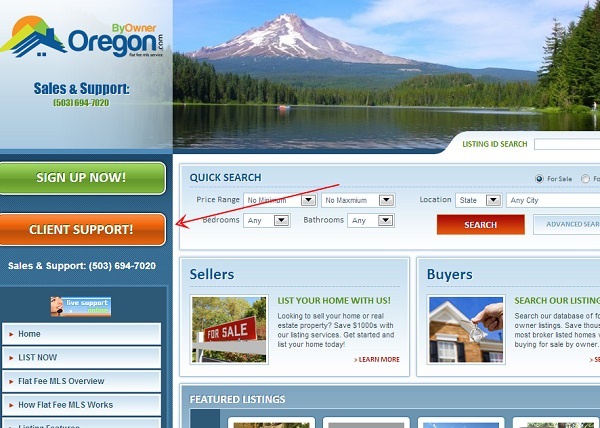 You can make a change to your MLS listing two ways: The first way is to log into your ByOwnerOregon.com account then under the "MLS Listing Management" you will see a drop down menu. Click on the drop down and select "Change Request". The second way is to click on the "Contact Us" link on the left hand menu bar. The click on "Support". Then select the "Change Request" from the drop down. You can also access the "Change Request" form by clicking on the following link: Click Here. Once you submit the change request form we will make the change to your MLS listing typically within 24 hours and e-mail confirmation to you. How do I post an "Open House" on the MLS and other real estate websites? To schedule an "Open House" you need to log into your account on ByOwnerOregon. This will take you to the "Listing Control Panel". Then scroll down to the "My Tools" section. Click on the "Schedule Open House - MLS & Realtor.com" link and complete form. How soon do I have to process the "Status Update Request" form after I have accepted an offer? You have 24 hours to process the "Status Update Request" form. If the status of the MLS listing is not updated timely the local MLS association can issue a $250 fine that will be passed on to the home-seller and paid out of closing. I have a For Sale By Owner ad on Zillow.com, will my Zillow page continue to display if I list my home on the MLS? Your Zillow.com page will be updated with the MLS listing information once the listing is posted on the MLS. It will no longer display as a "For Sale By Owner" listing. I have accepted an offer now what? We have prepared a sample Transaction Flow Process page for you to refer to. 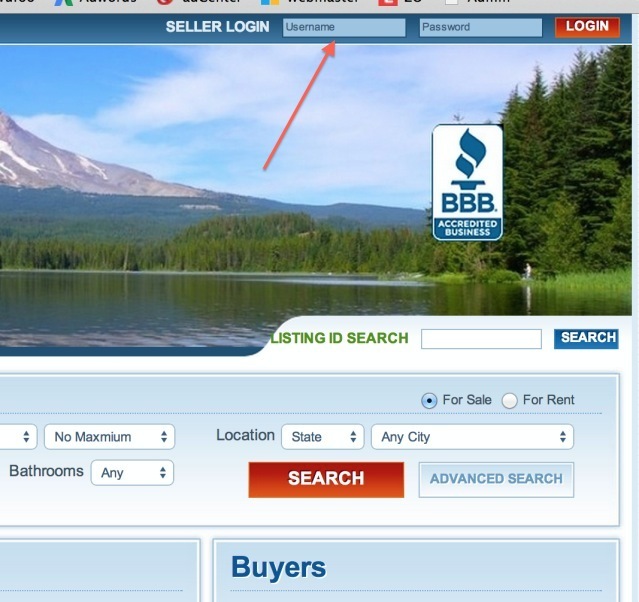 You can access it by logging into your ByOwnerOregon.com account then under the "MLS Listing Management" you will see a drop down menu. Click on the drop down and select "Transaction Flow Process". I see that you have a link to open escrow with Lawyers Title. Do I have to use Lawyers Title as my escrow company. No you do not have to use Lawyers Title. We recommend them because they are very familiar with Limited Representation listings and understand that we do not sign a lot of the documents with this type of transaction. If I find that I need help after I accept an offer do you have a service option I can purchase to have a real estate broker represent me? Is there support available to me after I accept an offer? Most traditional real estate agents work with a team of preferred vendors they use on every real estate transaction to insure their transaction goes smoothly. This team consists of loan officers, escrow officers, home inspectors, various contractors, insurance agents and movers. Over the years of offering "For Sale By Owner" services we have found some vendors are better working directly with home-sellers than others. We have put together a team of the vendors that have proven to provide the best services to our clients and consistently provide a high level of customer satisfaction. The following FSBO Support Team has been assembled with top professionals that understand how to handle our limited representation listing transactions and are willing to assist you throughout the process since you don't have a traditional real estate agent representing you. Click here for information about our support team! What is the name of the Real Estate Company that will be listing my home on the MLS? The Real Estate Company that inputs our listings in Oregon is Realty Net, LLC. They are the parent company of The Associates Realty Group which lists properties in Central Oregon MLS, MLS Direct which lists properties in Southern Oregon MLS and Home Max, LLC. which lists properties in the Lincoln County MLS. After I order a Flat Fee MLS package, how long does it take for my listing to be input into the MLS? You can cancel the listing at any time by providing us with written instructions to do so (assuming there is not a contract pending on the property involving a buyer who was procured by a cooperating broker). There are no termination fees or other penalties in the event that you wish to cancel your listing. However, no refunds will be provided. Yes. Real estate agents do not work for free. To be listed in the MLS, you must advertise a commission to the agent who represents the buyer (aka cooperating broker) . If a real estate agent presents an accepted offer and it goes to closing, you must pay the commission advertised in the MLS listing. The commission is paid at the close of escrow. No. Under the Flat Fee MLS listing program, our services are strictly limited to listing the property in the MLS. If you feel that you need assistance in interpreting or determining the merits of a purchase offer, conducting negotiations, completing the required disclosures and inspections, or otherwise moving your transaction to settlement, we recommend that you obtain professional representation. NOTE: Some of our brokers offer full representation for an additional fee (either paid in advance or at closing). If you are interested in that type of service, please inquire with your listing broker. How can you provide this flat fee listing service so inexpensively? You can make as many price changes or status changes as you need. To request a change to your MLS listing just click on the "Client Support" menu option on the left side menu bar and select "Change Request". Other than price or status changes you are allowed three listing changes or modifications free of charge. Any additional will be made at a charge of $25 per change. If a buyer calls you about our property what do you do? We refer all buyer leads directly to you. If a buyer calls and says they are represented by and agent, we suggest they have their agent call you and set up the showing. If a buyer is not represented at this time, however expresses that they wish to be represented by an agent to see your home, the listing broker may show your home. If I find a buyer with no agent, do I still pay a commission? No. You are free to sell the property to any buyer not procured or represented by a cooperating broker, in which case no cooperating broker commission is due. Is your flat fee listing fee refundable? No, once a listing package is purchased and credit card is processed all sales are final immediately and payments are non-refundable. Please make sure you definitely want to use our services prior to purchasing. If you are unsure for any reason we recommend contacting us prior to purchasing our services to get all your questions answered to make sure you feel comfortable with moving forward. No, but Realtor's® depend on quick access. Realtor's® show many homes within a very short period of time, access to your home may make a difference. We strongly recommend a Realtor® lockbox. What is the difference between my local MLS and Realtor.com? Do not confuse Realtor.com with the Realtor MLS. They are two separate systems, and Realtor.com is operated by MOVE, Inc. Realtor.com downloads property data from the hundreds of local MLS’s and makes that property data available to the public. Realtor.com is not a “For Sale By Owner” website, so seller’s contact information is not available or permitted to be posted. It is acceptable to list the seller as the property contact on the local Realtor MLS; that’s because, it is ONLY accessible to Realtors. We list you as the contact on the local MLS. The MLS advantage is that every single broker and agent participating in the MLS has an incentive to sell your home, effectively putting every agent in the area to work for you! The first place a buyers agent looks is always the MLS, so there’s simply no better way to gain instant and widespread exposure for your home. When a Seller purchases a Flat Fee MLS listing and the listing is posted on in the MLS database is the listing still considered "For Sale By Owner"? To list a home in the MLS it requires a Listing Agent to do it. The listing is considered a Limited Representation listing which means that the Seller is representing themselves and they are not paying the Listing Agent to represent them. Why should I list my property with you instead of some other Flat Fee company? As a For Sale By Owner, your exposure to potential buyers is limited. Your choices for advertising are generally confined t yard signs, newspaper ads, for sale by owner and classified websites, open houses, and word of mouth. This is often not enough to attract buyers, most of whom are working with agents. Real estate agents consider the MLS as the inventory of homes to sell and use it to locate properties for their clients. Will my contact information be displayed? 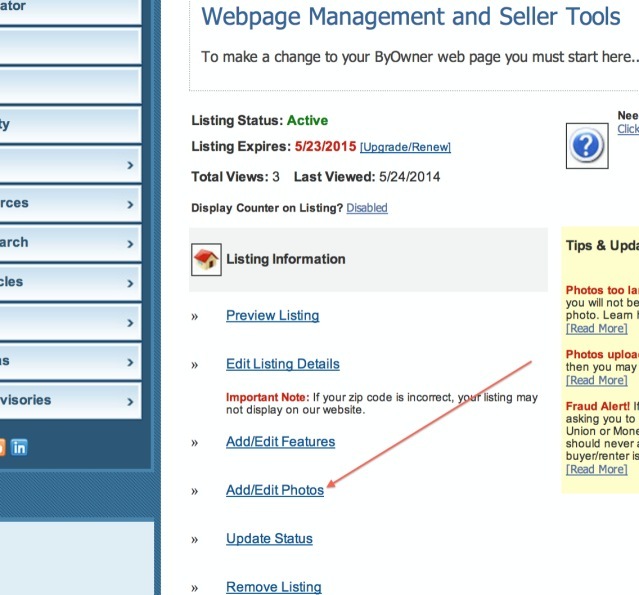 On the MLS, yes it will be displayed for agents so they can contact you directly for showings. In some cases your broker may also be able to post your email address. On “public” websites, such as Realtor.com or Zillow.com, only the brokers contact information is allowed to be displayed. The reason for this is because the MLS has rules about what information is allowed to be syndicated to 3rd party websites. Neither you, nor your broker can do anything about this, and these rules are strictly enforced. Yes. Your property will be listed on Realtor.com and most other popular real estate websites (websites vary depending on syndication feeds from your local MLS). These internet listings will give you national exposure to all home buyers. Since hundreds of people move to other states daily, this exposure can be a vital component in selling your home quickly and for the best price. Independent websites will obtain your listing directly from the MLS. Keep in mind that they pick up whatever they wish from your MLS listing to publish on their website. Thus, we have no control over these independent websites and we cannot change or edit their content. Realtor.com is the only website that can be edited by your broker, and only if you purchase the “Showcased Listing” upgrade with your listing plan. Note: All Oregon listing plans include the Realtor.com “Showcased Listing” upgrade.